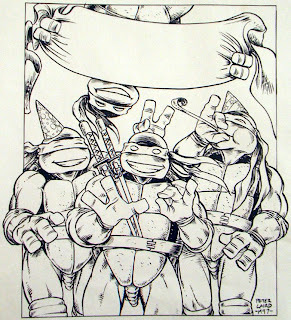 Peter Laird's TMNT blog: Blast from the Past #160: TMNT birthday card...? -->> .. o there it is, i was lookin' for that piece all this time !! Wow you had it all along !! Happy birthday , Tokka !! ah you shouldn't have !! Aahh .. i'm the luckiest guy in d' world !! Ah chucks thanks, Pete !! ! !